What is “Casinomeister” mobile slot about? Casinomeister is a NextGen Gaming mobile slot for devices such as smartphones and tablets that run iOS or Android operating systems such as iPhones. The game requires no download as it uses HTML5 and so can be accessed via mobile web browsers. The slot offers up to 20 paylines and has 5 reels consisting of 3 rows each. A maximum of 20 coins can be played per spin and each coin can be worth denominations between €0.02 and €4.00. A maximum win pays out a jackpot of 10,000 coins, which is multiplied by the initial bet on the winning payline. Game features include wilds, scatters and free spins with multipliers but no further bonus features are available. NextGen Gaming’s Casinomeister is a graphically well-designed 2D slot and the slot itself consists of lots of colours. The background is a simple green pattern but the symbols are well-drawn and give off a well-defined look. A jingle plays with each spin and animations play for winning paylines. An auto-play option is available to keep the game from entering the tedious stage of constantly clicking spin. 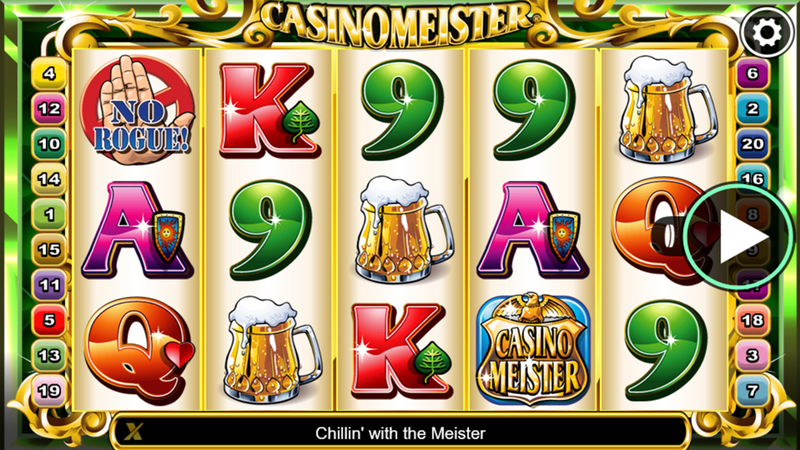 Casinomeister is a slot which consists of 5 reels (with 3 rows each) and up to 20 paylines to play with. A maximum bet takes 20 coins and coin sizes range from €0.02 to €4.00. A maximum pay-out will return 10,000 coins to lucky players and this will be multiplied by the initial line-bet of the winning payline. The game pays left to right and follows conventional slot rules. The rest of the pay-outs can be viewed via the game’s pay-table. Game symbols include playing cards (9 through to ace), the meister (wild), vortran (scatter), a rogue, a rogue behind bars, the Casinomeister golden badge, a medal, a ‘no rogue’ symbol and a beer. The wild substitutes for all symbols except for the rogue symbol, the rogue behind bars and the vortran symbol. Landing 5 of these symbols on an active payline wins 10,000 coins. Matching 3+ vortran symbols activates the free spins feature which has a 3x multiplier applied to any winnings. This feature potentially gives ‘infinite’ free spins but when a rogue symbol appears, the player will have on 5 free spins remaining; if the player manages to land a ‘behind bars’ symbol during these last 5 free spins, then the feature is re-triggered. The feature ends if no ‘behind bars’ symbol appears. There are no further bonus features. Master the world of slots.